Sometimes when you return from vacation, you find that something unpleasant has "hit the oscillating cooling device", and the day you took off is now getting made up in the overtime you're working to fix whatever has broken loose. This time, when I returned from my snowboarding trip, I was greeted by something far more pleasant. Tolar Manufacturing was announced as the Autodesk Inventor of the Month! 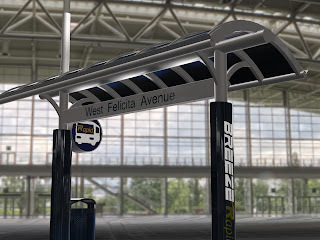 Tolar Manufacturing makes bus shelters for cities all over. They're designed in Autodesk Inventor, and their presentations are shown in Autodesk Showcase. They're storing all that CAD goodness inside of Autodesk Vault. Between using Inventor, Showcase, and Vault. Tolar is able to design, present, store, and reuse all their data. Inventor makes the data more robust, Vault allows the file to be tracked, located, and reused, and Showcase allows them to present the design intent to the cities that will be using their products. It's a nice little engineering circle of life. So why am I beaming with pride? I helped set up their Vault, install their Inventor, and train them on Showcase. It's really exciting for me to see where they've gone. Does that mean I was an indispensable part of the team? That they "could have done it without me?" No, I just played my small part. They took the tools, and ran with them. The credit is truly all theirs. I'm just happy that I got to play that little part! So here's a video! Not mine though. This one is all about Tolar, and what they've been able to accomplish! Maybe it'll inspire all of us to look again and our tools, and make sure we're using them to their full potential! Copy Design in Autodesk Vault - Where I used it.